Lieutenant Uhura. (Voice by Nichelle Nichols). Starfleet officer assigned as Communications Officer on the U.S.S. Enterprise while under the command of Captain James Kirk. Uhura was born in 2239 on Earth in the United States of Africa. Uhura completed Starfleet Academy in 2261. In 2266 she was assigned to the command section of the Starship Enterprise, but she quickly transferred to Engineering and became the ship's Communications officer. Uhura was a supremely proficient technician and was considered by Captain Kirk to be as capable and reliable as any Lieutenant aboard. Uhura is a people person and is very well liked by the entire crew. She often entertained in one of the starship's Recreation Rooms by singing ballads from around the galaxy. On stardate 5483.7, while under the influence of the women of Taurus II, the male crewmembers of the Enterprise were incapacitated enough by the "siren's song" to nessecitate that Lieutenant Uhura assume command of the ship. She and Nurse Chapel led an all-woman landing party that beamed down to Taurus II to rescue Kirk, Spock, and Dr. McCoy. ("The Lorelei Signal"). In 2269, on stardate 5591.2, the Enterprise visited the Amusement Park planet. The Keeper of the planet had died and Uhura was abducted by the planet's computer which was then in charge of the planet. The computer felt that it was being taken advantage of but Uhura reasoned with the computer and it ceased its hostile actions against the Enterprise's crew. ("Once Upon a Planet"). Uhura along with Spock and Sulu, was a member of the mission to transport a Slaver stassis box to starbase 25 on stardate 4187.3. ("The Slaver Weapon"). In 2270, Uhura, McCoy and Sulu became trapped in the holographic recreation room when the ship's computer began exhibiting aberrant behavior following the ship's passage through an energy cloud. ("The Practical Joker"). On stardate 5275.6, Uhura, along with the rest of crew, contracted Dramian Auroral plague. Uhura collapsed on the bridge from the effects of the disease and would have died had Dr. McCoy not found a cure. ("Albatross"). On stardate 6770.3 after the Enterprise entered an anti-matter universe, the crew of the ship experienced accelerated reverse aging and Uhura was reduced to infancy. After the starship returned to normal space, the crew were returned to their normal ages by use of the ship's transporters. ("The Counter-Clock Incident"). 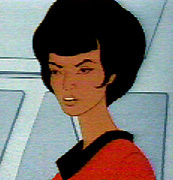 Lt. Uhura appeared in all but seven episodes of the animated series: "Yesteryear", "The Survivor", "Mudd's Passion", "The Ambergris Element", "The Eye of the Beholder", "Jihad", "Pirates of Orion." Nichelle Nichols portrayed Lieutenant Uhura in the live action Star Trek series and movies as well, and she also provided the voices for several other characters in the Animated Star Trek series. Uhura was never given a first name in any television episode or movie. In her 1994 autobiography, "Beyond Uhura - STAR TREK and Other Memories", Nichelle Nichols states that she remembered the Animated STAR TREK series fondly and was particularly enamoured of the episode "The Lorelei Signal" chiefly because in it Uhura had a large role - she actually took command of the Enterprise in order to rescue Kirk, Spock and McCoy!